Having somewhat overdosed on psychological thrillers during the last few years I vowed to cut down during 2018 and it’s one of the few bookish resolutions that I’ve kept, but… and there is always a but; I started to miss the rollercoaster ride that this sub-genre produces so well and I so I treated myself to a copy of a book by an author who’d previously wowed me with her book Watching Edie. If anything The Lies We Told was even better! The opening scene is that of a young mother who finds the corpse of the family budgie – the killer is her young daughter Hannah. But that is all in the past and the dangerous daughter is left behind while we move to Clara’s story in the present. Clara lives a ‘normal’ life. She’s happy, a working woman with a lovely boyfriend who she’s planning to move in with when he suddenly disappears. Clara does all the normal things: checks with his friends, drives down to see his family and looks in pockets & drawers to try to find clues, but there are none. What Clara does find, of course she does, that Luke wasn’t quite the man she thought he was. Some things are excusable though, Luke’s sister Emily had disappeared without a trace some twenty years ago. From the little Clara knows this caused untold anguish certainly to Luke’s parents, Oliver and Rose Lawson, and to a lesser extent to Luke and his brother Tom who were all left to wonder what had happened to Emily. This is a classic psychological thriller. We have a mixture of characters, all nicely distinct and most with a little bit of good, and a little bit of bad inside them – half the fun of this genre is to work out as you are reading how the stresses of the story, and this one has enough tension to make you feel like you are walking on a high wire, are influencing your view of their actions. After all if your boyfriend went missing and then you found out that he wasn’t quite the Mr Perfect you thought he was would you cut your losses there and then, or would you feel that you had to help in any way possible to help his family find out what has happened – even if that means keeping the biggest secret of all, that Emily has returned? The story rattles along, the psychopathic child inserting herself into the story line at regular intervals even though there is no obvious place for her – has she completely transformed? 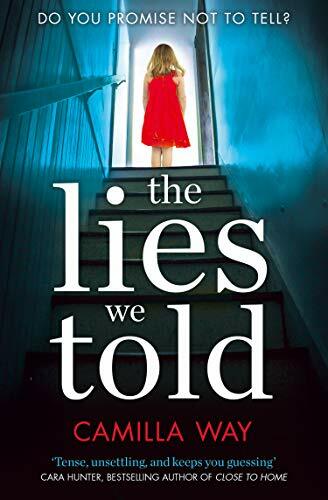 Surely not, this is a psychological thriller after all and that means that scary bad personality traits only go in one direction, yes to even more dark and scary places! Camilla Way is the absolute best at pulling all the seemingly disparate strands together and although I confess I had worked out some elements given some well-placed clues, I was still a mile from the whole truth. The ending was perfect, not quite the resolution the reader might expect but satisfying enough to allow this one to close the book with a smile. This book has got some good reviews. I hope to read it soon. Thanks for sharing your fabulous views on it. I’ve been hearing some good things about this one, Cleo, and it’s nice to know it’s lived up to its promise. The story does sound intriguing, and now I want to know how that first part of the story (with Hannah) ties in with the rest. Glad you enjoyed it so well! I’ve been hearing good things as well. I’m taking a break from these books too, but I know that I’ll be back to them at some point, right? I loved this book! Thanks for sharing, Cleo, and even though I’ve tried to mix up lighter genres with my thrillers, the intensity of that genre always grabs me. What a fabulous review, Cleo! Sounds like breaking your vow paid off. I need to go check out this author. I do love when you are reading a thriller and think you have it all worked out, but then realise that you don’t! Sign of a good one. Great review Cleo. Yet another title for my ever expanding TBR. I have never read this author before but boy does this sound like one that would keep you on your toes guessing to the last page. I will have to look this one up after reading your review, perhaps a read for a day off or vacation! Fantastic review!! I really enjoyed Watching Edie too and can’t wait to read this. I will save your review as this one is on my table to start in a couple of days. This genre is definitely a guilty pleasure of mine too, I wish I had more chances to read it! And it never ceases to amaze me-what is with people thinking they’ve lucked out finding Mr. or Mrs. Perfect-they simply don’t exist-something’s got to go wrong sometime….